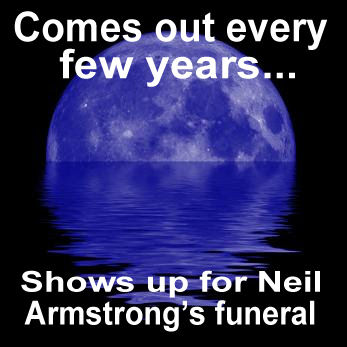 Neil Armstrong, the first man to step foot on the moon was laid to rest yesterday, August 31, 2012. Coincidentally, there was a blue moon on the 31st. A Blue Moon is the appearance of the third full moon in a in a season with four full moons. It is never really blue. The term has also been used to refer to the second full moon in a month. There won’t be another blue moon until July 31, 2015.